Dr. Colin Yoshida of Fremont Dentistry is proud to offer more patients the opportunity to receive dental implants thanks to his use of the Laser Assisted New Attachment Procedure (LANAP). For Fremont patients that have lost teeth as a result of gum disease, the use of this new advanced gum disease treatment gives them a better chance for successful implants by removing disease. 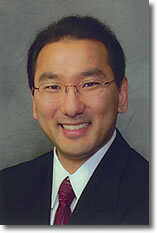 Dr. Colin Yoshida Brings Laser Periodontal Disease Treatment to Fremont, CA. Dr. Colin Yoshida, a general dentist at Fremont Dentistry, offers patients advanced treatments for gum disease and its effects, such as the loss of teeth. Dental implants are the top choice for tooth replacements, but Dr. Yoshida recommends that patients do not receive implants until gum disease is removed. Fremont patients now have the ability to receive a new gum disease treatment known as Laser Assisted New Attachment Procedure (LANAP) that can ensure their gums are healthy enough to successfully receive implants. LANAP has recently been cleared by the FDA for use in the United States and has proven to be effective in the treatment of gum disease as well as the rejuvenation of bone. It is minimally invasive, especially compared to traditional scalpel methods, and results in little to no pain or discomfort for patients. While other gum disease treatment options in Fremont remove diseased tissue, they also remove some nearby healthy tissue. LANAP is able to concentrate on the affected areas only, leaving all healthy tissue completely intact. LANAP is the only gum disease treatment in Fremont that is proven to stimulate the growth of new bone. Stimulating bone growth can help preserve natural teeth that were at risk for tooth loss, reducing the amount of dental implants a patient might have needed. The development and use of LANAP is the first of its kind that both successfully treats gum disease and also delivers improved bone density and health. For teeth that cannot be saved, Dr. Yoshida can replace them with dental implants. Implants are an effective continuation of the bone growth stimulated by LANAP, as their placement prevents the further loss of bone that may continue over time. As resorption occurs, the shape of the jaw, mouth and face of a patient is altered, sometimes leading to the need for bone grafts or reconstructive surgeries. In these situations, dentures are often the only option for the replacement of lost teeth. Thanks to Dr. Yoshida’s use of LANAP, patients who previously would not have been able to receive implants due to the existence of periodontal disease may now be able to. Visit Dr. Yoshida’s website or call his office today to learn more about how he may be able to help you. Fremont Dentistry is a general practice offering personalized dental care for patients in Fremont, CA. Dr. Colin Yoshida graduated from University of the Pacific School of Dentistry and is part of one percent of dental professionals providing the only FDA cleared laser procedure for gum disease treatment. To learn more about Fremont Dentistry and their dental services visit their website at http://www.fremontdentistry.com and call (510) 648-3184.